the ingredient list is short enough to memorize: everything in small measures (except for the cream, oops), and of the highest quality you dare to buy. what follows that is an utterly satisfying set of cooking steps (crush, season, sear; pour in, spoon out, whisk, stir). it comes together like a song. 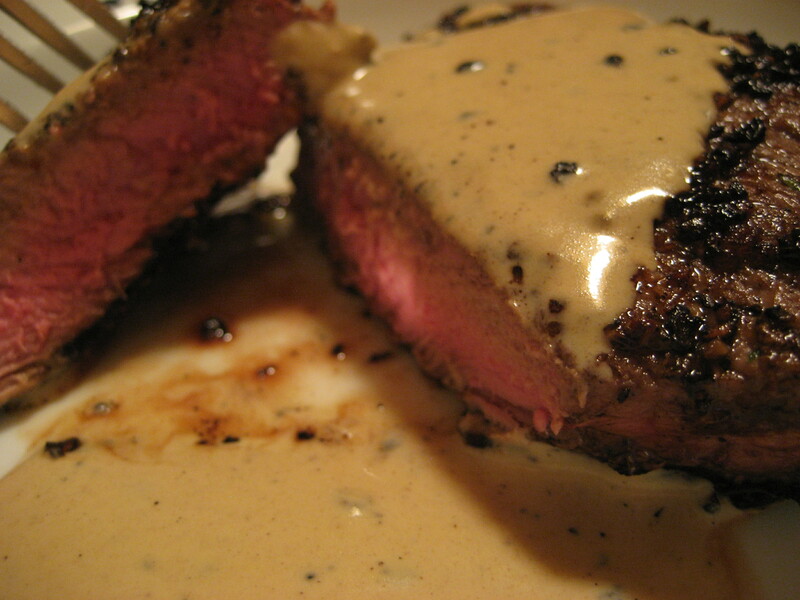 what arrives at the dinner table then is a pepper-crusted round of gorgeously browned beef, poured over with a richly flavored cream sauce good enough to warrant some plate-licking – or at least some very earnest scraping of the spoon. it’s a dish that’ll please both the hungry steak-lover and the elegant diner – just the thing to bookmark for that holiday coming up in february… or just dinner for your dichotomous self. 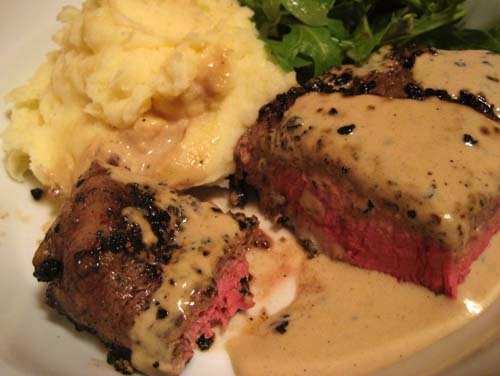 Remove the steaks from the refrigerator for at least 30 minutes and up to 1 hour prior to cooking. Sprinkle all sides with salt. Protect your work surface with layer of newspaper. Place peppercorns on a paper towel and fold over so that peppercorns are between two layers of paper towel. Coarsely crush the peppercorns with a mallet, rolling pin, or other weighty object. Spread the crushed peppercorns evenly onto a plate. Press the filets, on both sides, into the pepper until it coats the surface. Set aside. In a medium skillet over medium heat, melt the butter and olive oil. As soon as the butter and oil begin to turn golden and smoke, gently place the steaks in the pan. For medium-rare, cook for 4 minutes on each side. Once done, remove the steaks to a plate, tent with foil and set aside. Pour off the excess fat but do not wipe or scrape the pan clean. Off the heat, add Dijon and brandy to pan, then whisk together. Carefully ignite the alcohol with a long match or firestick. Gently shake pan until the flames die. Return the pan to medium heat and add the cream. 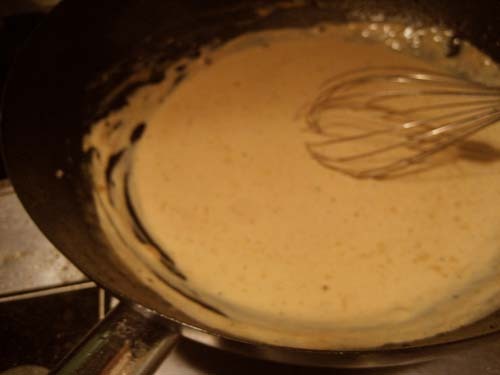 Bring the mixture to a boil and whisk until the sauce coats the back of a spoon, approximately 5 to 6 minutes. this has been a good weekend, guys. i liked it. i got all sorts of things started that i can’t wait to finish, and that’s just the best feeling. this picture gets me dreaming in all sorts of ways. a cool, country evening… a big porch… barefoot in a ruffled sundress… and yes, some lavender lemonade. sigh, one day. but for now, at least the lemonade part.